starting: Monday 29th April 2019 at 7pm. Perfect for meeting new people, reducing stress and keeping fit. Stop putting it off and join our community today! Unsure if Salsa is for you? Then come along and try our FREE Introductory lesson, which is on the first lesson of every new 8 week course! In this lesson we will do our best to give you a taste of what Salsa dancing is about and the social dance nights we provide. If you would then like to sign up you can do so on the night – which costs £49 cash. Although booking online before the start date helps us in regards to knowing who is coming. So we offer a £9 discount if you book your spaces online early. What if I have danced before do I still need to do the Beginners Course? We will aim to progress every week covering; Understanding the Salsa Rhythm, Salsa History, Finding the beat, connection and movement in partnership, some of the step covered will include Basic steps, side step, back step, open out, right and left turns for lead and followers, Crossbody Lead, Crossbody Lead Walkthrough, Crossbody Lead Inside turn. With the emphasis on keeping the rhythm and listening to the music in these steps. No, you do not need to come with a partner as we constantly swap partner’s during class. This means you will get to dance with everyone throughout the class. Making it better for learning, and creating a more social experience. 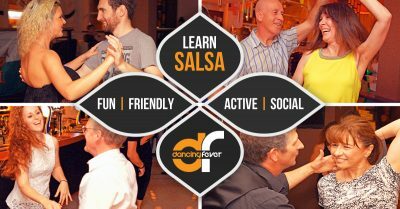 What will I do once I have completed the Beginners Salsa Course? We encourage everyone to repeat the Beginners course, to make sure you get the fundamentals mastered. Then we have higher level classes for you to attend which are currently taught on a drop in basis. Plus we have regular Parties, Special Events and go on weekends away dancing together. What if I can not make all the classes? We encourage everyone to make an effort to make all the classes, as we progress each week, and it will be best for your learning. However if you miss the odd class please do not worry, as we recap everything from the previous week.